The other day I stood in a line of about fifty people waiting for an opportunity to cast my vote. The line moved rather slowly, and by the time I got to the voting machine, there were another fifty people behind me. I thought it was pretty cool that I could stand in line with people of all different walks of life, of a different race and culture than myself, and express my opinion via the vote as to who should be elected to office. This is hard to get my mind around sometimes though. We elect people into office in this country—or at least we go through the motions of an election to put people into power. If we are responsible for putting someone into office, then why do Christians say God has established someone in a position of authority over us? What if they are corrupt or inept? Is it possible that sometimes God allows us to choose to elect someone who may not be honest and trustworthy or a good fit for the position? Apparently so. A quick look back into history tells us that we as human beings have not been very good at choosing leaders for ourselves. I am reminded at this particular moment of how the nation of Germany began to move Hitler into power, thinking he was going to make their nation great again and save them from their poverty and help them rebuild. No doubt, there was some good at the beginning, but ultimately the power Hitler took to himself destroyed nations and killed people in a catastrophic way. And it took a world war and the loss of millions of lives to end it. Going farther back, I am reminded of what is written in the book of Daniel. Daniel did something which is not easy to do—living as a God-fearing man in service to a pagan tyrant, a king who simply spoke the word and whatever he said became law. Daniel’s life is a good example of how to live in a godless society and still serve God, being faithful to the Word of God and prayer in spite of the restrictions in one’s work and everyday life. Daniel was always taking risks you and I would find very difficult to take. He started out his service at the palace by refusing to eat the specialty foods and wines offered him and insisting on eating only simple foods and drinking water. This request he made could have caused him to simply be executed, but God gave him grace and favor. The grace and favor of God seemed to cover every part of Daniel’s experience in Babylon. But what stands out most in my mind today considering our current political environment and the concerns people have expressed about the leadership of our country, both local and federal, is the story about Nebuchanezzar’s dream. God speaks to us in dreams often, yet we don’t usually in this society pay attention to what God is trying to tell us through our dreams. Back then, there was an attentiveness to such things and the ones who normally attended to them were the wise men, the ones who were soothsayers, magicians, astrologers and conjurers. Nebuchanezzar had scores of them around to help him with his dreams, but one morning he woke up very disturbed by a dream, and none of these clever men were able to tell him what his dream meant. I’ve often wondered whether they were just afraid to tell him what the dream meant, because he might have gotten mad and killed them all (he had a habit of doing that). In any case, he finally got around to telling Daniel about the dream. Daniel, who the king called Belteshazzar, was the chief of the magicians—interesting that he rose that far—and the king recognized in him “a spirit of the holy gods.” Nebuchadnezzar may have been as far from God as a person could get, and yet he was able to recognize the presence of God in Daniel in all he said and did. This says a lot about what kind of person Daniel was and how he lived his life. Daniel hesitated at first to tell the king what his dream meant but the king insisted that he do so. Finally, Daniel explained that the dream was a message from God telling the king if he didn’t humble himself and give God the glory, and repent of his wickedness and tend to the poor and needy in his kingdom, God would see that he would lose his sanity and wander about as an insane beast for seven years, until he recognized God as Lord of his kingdom. It was a miracle the king didn’t assassinate Daniel on the spot. There are historical records, I’ve been told, of a seven-year silence in the reign of Nebuchanezzar. The biblical record says about a year after his dream, he was arrogantly boasting about his position and power when an angel informed him the dream was now becoming a reality. Isn’t it interesting that today our Bible includes a story written by this king, telling us of what happens to a ruler when they presume to believe they are the only supreme authority in this world? He lost his mind temporarily for seven years, and then God restored the kingdom to him. After that, he was a little more respectful of God, though I doubt very much he ever stopped worshiping idols. Whatever may happen in the political arena we can know God is ultimately in charge. Our voting and working as politicians and public servants need to be seen as our participation in what God is doing in this world. God is and always will be the One who is Lord of all, but he includes us in what he does as our sovereign Lord. God allows people to hold power in this world, and he holds them accountable for everything they say and do, especially when it creates suffering and hardship for those who are powerless and needy. The purpose of being given responsibility and authority over others is not so we can become self-indulgent, self-important, and arrogant, but so we can help and serve others, humbling ourselves to make other people’s lives better and to enable them to know, love and serve God and one another in the true freedom which is ours in Christ. Political power and authority are transient—they cannot be counted on. Some people hold office for decades in some countries, not because they are good leaders, but because they force their will on others. God’s purpose is not for us to force our will on others, but to enable others to follow God’s will, and to live freely in loving respect for one another. We have been given great freedom in this country to have a change after a few years to another leader. We should be grateful, and participate in the voting process as much as we can. The book of Daniel tells us that one day God will establish a divine kingdom that will grow and fill the whole world, ultimately bringing low every other human government. This government was established in Jesus Christ in his first coming, and is at work today in the world by the Holy Spirit within the universal Church of believers. As we follow Christ and bravely live out and share the truth of God’s love in this world, we participate in and live in God’s kingdom, and enable others to experience its benefits within our world even today. May we be heavenly kingdom minded and Christ centered as we live, work, and serve in this earthly world today. We, as believers in Christ, need to obey the apostolic admonition to pray for our leaders and for those who carry political power. Pray that we may continue to live quiet and peaceful lives as believers, and that we may be free to share the good news with our neighbors, friends, and families. Pray also that God will grant us as believers grace and favor with all those in authority, so that we can continue Christ’s mission in our community and in the nation as a whole. If you, as Daniel did, have the gift of political leadership, then place that gift at Jesus’ feet and serve where he calls you to serve. Do the work of Christ fearlessly, trusting God will grant you grace and favor as you need it. We need leaders who are not afraid to “do justly, love mercy, and walk humbly before your God.” We need leaders who are willing to take the risks necessary to bring about change. It is a tough political arena right now, but what we need in that arena are spiritual warriors who are willing to take the hits for being honest, humble, and compassionate, and who are submissive to the will and purposes of our Lord Jesus Christ and his heavenly Abba. May the Spirit do a mighty work in this nation and bring many to humble service so we can see some real change that lasts. Dear Abba, it is a blessing that you have made your Son Jesus Christ Lord of all. We are thankful you are still in charge, and that even when we fail to make good choices about our leaders, you still are at work in the midst of our failures. We ask you for godly men and women to lead us in this country who are equipped for servant leadership and who are filled with the Spirit. Lord, give our leaders wisdom, compassion, and humility—a spirit of service toward those they are responsible for. Grant us courage to confront and challenge our leaders when necessary, and the grace to respect and follow them as they follow you. In Jesus’ name we pray, amen. This entry was posted in Blog Site and tagged authority, Christ, Christian life, culture, Daniel, God, govern, government, grace, Holy Spirit, humanity, Jesus, king, kingdom of God, leader, leaders, life, live, Nebuchadnezzar, office, participation, political, politics, public servants, service, Spirit, trust, truth, vote, voting. 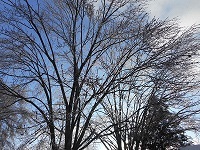 Tree covered in ice silhouetted against the sky. One of the difficulties of life as a single parent is the need to do things for your children which are normally done by both parents. It’s really difficult to play the role of father and mother for a child. There are some things only a mother does well, and some things only a father is really good at. We do the best we can as single parents, but there are some things we just can’t do. It was easy for me to see early on as a single mom, I could never provide for my son or daughter the feeling which comes when a dad recognizes, values and affirms his children. I could recognize the hunger for this affirmation and attachment, but I still could not fill those needs. A father has the capacity to destroy his children’s self-worth and crush their belief in themselves and in their ability to succeed simply with a glare or condemning word or by indifferent neglect. But he also has the ability to teach a child to take on challenges and to believe he or she can do the impossible. He can teach them what it means to be loved and valued as a human being. It’s all in how a parent leads. I was raised in a family which valued authority because of what they believed about who God was. In the early years, dad was in charge and nothing happened without his approval and direction. We feared him and did our best to be good kids so as not to upset him. As an older adult, I realize now my dad repented of this way of leading the family, and began to mellow over the years and eventually learned and used the power of love and understanding to bring about change in his children in place of authoritarian control. As a teen, I experienced his grace and understanding in many ways. He understood in his later years that leading in love is much more effective than leading by control and coercion. Control and coercion are external motivators. Motivators like shame, guilt, fear and anger are also external motivators. Dictators, controlling and dominating people, and terrorists like to use motivators such as these to force people to agree to their expectations and terms in an effort to create a society in which everyone does the same thing. These external motivators may create a form of unity, but it is a unity that is merely in form, not necessarily in content. In other words—you may have a person’s compliance, but you don’t necessarily have their wholehearted obedience. The most powerful thing a parent, and especially a dad, can do, is to love, truly love, their children. This is the kind of love which sets healthy boundaries for a child and enforces them, not punitively, but with grace. This is the kind of love which values each child as a unique person, and so finds their bent and helps grow them to be that person God created them to be. When a parent has a strong, healthy relationship with a child in which they really see that child for who he or she is, and value their child as a gift from God, and are deeply involved in their child’s life, this creates a bond of love between the child and the parent. This bond can be highly motivating for the child, causing them to make healthy choices when they are being influenced to make unhealthy ones. Granted, life happens, and every person is different. Some children just go the wrong way, no matter how well loved they are. But this does not negate the reality, that when our family participates in and reflects the divine perichoresis, and is filled with love and grace, there is a strong bond of love which binds everyone together in love. There is a tolerance and respect which would not otherwise be there. Children find themselves motivated, for the most part, to do the right thing from a place inside. Love is an internal motivator which supersedes any other external motivator in its ability to create genuine unity. I believe this is why the apostle Paul stressed the need for a husband to love his wife, and for parents to love their children. Paul’s culture taught men to rule their wives and to insist that women and children submit to their leadership. Authoritarian rulership and coercion in a family may create external obedience temporarily, but they often crush the hearts of children, foment rebellion in teens, and can eventually destroy people. I have seen and experienced the tragedy that results in such leadership. The broken hearts and minds it creates are a testimony to its ineffectiveness and destructiveness in the long run. Love, however, creates a familial bond of unity, which motivates those involved to treat one another with respect and concern. Discipline—and here I mean training, not punishment—given in love and tempered with grace, enables children to learn to live within healthy boundaries, while giving them room to grow. In this type of environment there is freedom—freedom to be the people God created us to be, and freedom to treat each other with love and respect. Freedom goes both ways because it is bound up within God’s love. I was speaking with Doug Johannsen yesterday, and he reminded me that a father, and a husband, is meant by God to be the source (read “head” in most translations) of this love within a family. He is to be the one who pours this love so abundantly over his wife and children they cannot help but love him back and love one another. He is to be the source of this love which binds the family together in unity. Why is this true? Because this is how our heavenly Father so loves his Son in the Spirit. He loved him so much he gave him all of this which he made. And the Son, and the Father, so loved us, they created us and gave us everlasting life through Jesus in the Spirit, so we can live in the midst of this superabundant love both now and forever. It is this love, poured into our hearts by the Holy Spirit, which is to be the basis on which our families are built. This love which he receives from the Holy Spirit enables a father and husband to love his wife and family with the same love which caused Jesus to lay down his life for humanity. And this love creates an environment in the home in which a family can live together in real unity. This is the same love which we as single parents must draw upon to enable us to love our children and care for them when we are unable to fill the role of the missing parent. This love of God shed abroad in our hearts is the source of unity, love and grace in our family. And we can trust God to do in and through us what we cannot do on our own to care for, love and minister grace to our loved ones. Loving Father, thank you for the great love you shower upon your Son in the Spirit, and that we participate in this, your superabundant love, through Jesus’ life, death, resurrection and ascension, and in the gift of your Spirit. Grant us the grace to live in loving communion with one another in our families, churches, and communities, in the same way in which you live in loving fellowship with your Son, and with us through Jesus and by your Spirit. Amen. This entry was posted in Blog Site and tagged authority, child, children, Christian, Christian life, coercion, daughter, discipline, families, family, Father, freedom, God, God's love, grace, head, Holy Spirit, home, husband, husbands, in Christ, leader, leadership, leading, life, live, love, marriage, mother, obedience, parent, parents, participates, participation, perichoresis, person of jesus christ, power of the holy spirit, punishment, relationship, relationship with god, relationships, religion, son, Source, spirituality, Trinity, triune god, trust, wife, wives.